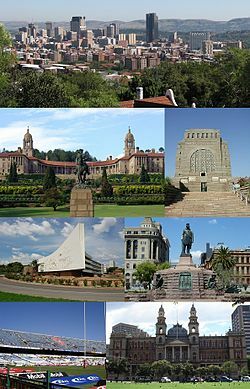 Clockwise from top left: Pretoria CBD skyline, Front view of the Union Buildings, Voortrekker Monument, Administration Building of the University of Pretoria, Church Square, Loftus Versfeld Stadium and the Palace of Justice. Pretoria is named after the Voortrekker leader Andries Pretorius, and within South Africa is popularly known as the "Jacaranda City" due to the thousands of jacarandatrees planted in its streets, parks and gardens. 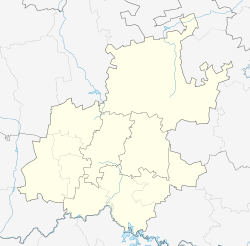 Pretoria was founded in 1855 by Marthinus Pretorius, a leader of the Voortrekkers, who named it after his father Andries Pretorius and chose a spot on the banks of the "Apies rivier" (Afrikaans for "Monkeys river") to be the new capital of the South African Republic (ZAR). The elder Pretorius had become a national hero of the Voortrekkers after his victory over Dingane and the Zulus in the Battle of Blood River. The elder Pretorius also negotiated the Sand River Convention (1852), in which Britain acknowledged the independence of the Transvaal. It became the capital of the South African Republic (ZAR) on 1 May 1860. The Second Boer War resulted in the end of the Transvaal Republic and start of British hegemony in South Africa. The city surrendered to British forces under Frederick Roberts on 5 June 1900 and the conflict was ended in Pretoria with the signing of the Peace of Vereeniging on 31 May 1902. The City is surrounded by the Magaliesberg Mountain range. Pretoria has a humid subtropical climate (Köppen: Cwa) with long hot rainy summers and short cool to cold, dry winters. The city experiences the typical winters of South Africa with cold, clear nights and mild to moderately warm days. Although the average lows during winter are mild, it can get cold due to the clear skies, with nighttime low temperatures in recent years in the range of 2 to −5 °C (36 to 23 °F). The average annual temperature is 18.7 °C (65.7 °F). This is rather high, considering the city's relatively high altitude of about 1,339 metres (4,393 feet), and is due mainly to its sheltered valley position, which acts as a heat trap and cuts it off from cool southerly and south-easterly air masses for much of the year. Rain is chiefly concentrated in the summer months, with drought conditions prevailing over the winter months, when frosts may be sharp. Snowfall is an extremely rare event; snowflakes were spotted in 1959, 1968 and 2012 in the city, but the city has never experienced an accumulation in its history. During a nationwide heatwave in November 2011, Pretoria experienced temperatures that reached 39 °C (102 °F), unusual for that time of the year. Similar record-breaking extreme heat events also occurred in January 2013, when Pretoria experienced temperatures exceeding 37 °C (99 °F) on several days. The year 2014 was one of the wettest on record for the city. A total of 914 mm (36 in) fell up to the end of December, with 220 mm (9 in) recorded in this month alone. In 2015 Pretoria saw its worst drought since 1982; the month of November 2015 saw new records broken for high temperatures, with 43 °C (109 °F) recorded on the 11th of November after three weeks of temperatures between 35 °C (95 °F) and 43 °C (109 °F). January 2016 saw Pretoria reach a new record high of 44 °C (111 °F) on January 7, 2016. Depending on the extent of the area understood to constitute "Pretoria", the population ranges from 700,000 to 2.95 million. The main languages spoken in Pretoria are Sepedi, Sesotho, Setswana, Xitsonga, isiZulu, Afrikaans and English. The city of Pretoria has the largest white population in Sub-Saharan Africa. Since its founding it has been a major Afrikaner population centre, and currently there are roughly 1 million Afrikaners living in or around the city. Even since the end of Apartheid, Pretoria itself has a white majority, albeit an ever-increasing black middle-class. However, in the townships of Soshanguve and Atteridgevilleblacks make up close to all of the population. The largest white ethnic group are the Afrikaners and the largest black ethnic group are the Northern Sothos. The lower estimate for the population of Pretoria includes largely former white-designated areas and there is therefore a white majority. However, including the geographically separate townships increases Pretoria's population beyond a million and makes whites a minority. Pretoria is known as the "Jakaranda City" due to the approximately 50 000 Jacarandas that line its streets. Purple is a colour often associated with the city and is often included on local council logos and services such as the A Re Yeng rapid bus system and the logo of the local Jacaranda FM radio station. 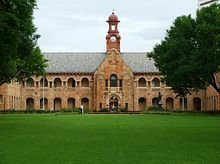 Some of the notable structures in Pretoria include the late 19th century Palace of Justice, the early 20th century Union Buildings, the post-war Voortrekker Monument, the diverse buildings dotting the main campuses of both the University of Pretoria and the University of South Africa, traditional Cape Dutch style Mahlamba Ndlopfu (the President's House), the more modern Reserve Bank of South Africa (Office skyscraper) and the Telkom Lukas Rand Transmission Tower. 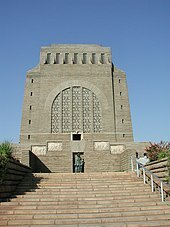 Other well-known structures and buildings include the Loftus Versfeld Stadium, The South African State Theatre and the Oliver Tambo building which is the Headquarters of the Department of International Relations and Cooperation(which is a good example of neomodern architecture in South Africa).The Lukasrand Tower is located on Muckleneuk Hill in the Lukasrand suburb on the outskitrts of the central city and is a prominent landmark in the skyline. Pretoria is home to the National Zoological Gardens of South Africa as well as the Pretoria National Botanical Garden. There are also a number of smaller parks and gardens located throughout the city, including the Austin Roberts Bird Sanctuary, Pretorius Square gardens, the Pretoria Rosarium, Church Square, Pretoria Showgrounds, Springbok Park, Freedom Park, and Burgers Park, the oldest park in the city and now a national monument. In the suburbs there are also several parks that are notable: Rietondale Park, "Die Proefplaas" in the Queenswood suburb, Nelson Mandel Park and Mandela Park Peace Garden and Belgrave Square Park. 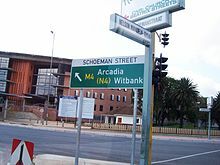 The N4 enters the town as a highway from Witbank in the east, merging with the N1 at the Proefplaas Interchange. It begins again north of the city, branching west from the N1 as the Platinum Highway, forming the Northern Bypass, and heading to Rustenburg. The N4 runs east–west through South Africa, connecting Maputo to Gaborone. Before the Platinum Highway was built, the N4 continued passed the Proefplaas Interchange to the city centre, where it became a regular road, before again becoming a highway west of the city. These roads are now designated the M2 and M4. There is a third, original east–west road: the R104, Church Street. Church Street is in the process of being renamed to a number of new names. The N14 starts in the centre of town from the M4 (former N4). It is a normal road heading south through the centre before becoming the Ben Schoeman highway. At the Brakfontein interchange, the Ben Schoeman highway becomes the N1, but the N14 continues as the intersecting west-south-western highway towards Krugersdorp. The R114parallels the N14 in its westward journey running just to the north of the highway. The South African State Theatre which houses the arts of Opera, musicals, plays and comedic performances. Atterbury Theatre in Lynnwood Bridge. Pretoria has a number of industrial areas, business districts and small home businesses. A number of chambers of commerce exist for Pretoria and its business community including Pretoriaweb a business networking group that meets once a month to discuss the issues of doing business in Pretoria. The members of Pretoriaweb also discuss issues in various social media environments and on the website. The Pretoria civic arms, designed by Dr Frans Engelenburg, were granted by the College of Arms on 7 February 1907. They were registered with the Transvaal Provincial Administration in March 1953 and at the Bureau of Heraldry in May 1968. The Bureau provided new artwork, in a more modern style, in 1989. In early 2010 it was again rumoured that the South African government would make a decision regarding the name, however, a media briefing regarding name changes, where it may have been discussed, was cancelled shortly before taking place. Rumours of the name change provoked outrage from Afrikaner civil rights and political groups. 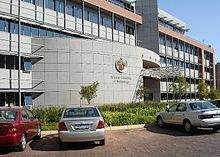 It later emerged that the registration of the municipality as a geographic place had been published in the government gazette as it had been too late to withdraw the name from the publication, but it was announced that the name had been withdrawn, pending "further work" by officials.The following week, the registration of "Tshwane" was officially withdrawn in the Government Gazette. The retraction had reportedly been ordered at the behest of the Deputy President of South Africa Kgalema Motlanthe, acting on behalf of President Jacob Zuma, as minister of Arts and Culture Lulu Xingwana had acted contrary to the position of the ANC, which is that Pretoria and the municipality are separate entities, which was subsequently articulated by ANC secretary general Gwede Mantashe. 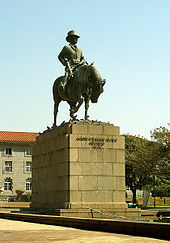 In March 2010, the "Tshwane Royal House Committee", claiming to be descendents of Chief Tshwane, called for the name to be changed, and for the descendents of Chief Tshwane to be recognised, and to be made part of the administration of the municipality. As of 2017, the proposed name change has not occurred and is now unlikely to happen. Note: Malls marked with an asterisk are malls with at least a 4-screen cinema complex. Kolonnade Centre was the only mall in the city with a public ice-skating rink. It closed due to high levels of rent and the management of the mall deciding to build shops in its place. In 2014, The Grove Shopping Centre as well as Forest Hill Mall both opened ice-skating rinks. Currently the Menlyn Park Mall is undergoing a substantial refurbishment and expansion which will, upon completion, make it one of the largest malls in South Africa. Frances Ames, neurologist, psychiatrist, and human rights activist. Margaret Becklake, academic and epidemiologist. Rory Byrne, chief designer at the Benetton and Scuderia Ferrari Formula One teams. George Gristock, VC award receiver. Steve Hofmeyr, singer, songwriter and actor. Gé Korsten, opera tenor and actor. Magnus Malan, Minister of Defence in the cabinet of President P. W. Botha, Chief of the South African Defence Force (SADF) and Chief of the South African Army. Eugène Marais, lawyer, naturalist, poet and writer. Tim Modise, journalist, TV and radio presenter. Es'kia Mphahlele, writer, educationist, artist and activist celebrated as the Father of African Humanism. Elon Musk, CEO and CTO of SpaceX, CEO and product architect of Tesla Motors, and chairman of SolarCity. Micki Pistorius, profiler and author. Louis Hendrik Potgieter, member of Dschinghis Khan pop band. ^ Jump up to: a b c d e "Main Place Pretoria". Census 2011. Jump up ^ "Gauteng's Human Development Index" (PDF). Gauteng City-Region Observatory. 2013. p. 1. Archived from the original (PDF)on 11 January 2015. Retrieved 1 January 2015. ^ Jump up to: a b "Global city GDP 2011". Brookings Institution. Retrieved 18 November 2014. Jump up ^ Raper, Peter E. (1987). Dictionary of Southern African Place Names. Internet Archive. p. 373. Retrieved 28 August 2013. Jump up ^ "South Africa's provinces: Gauteng". Retrieved 14 June 2011. Jump up ^ Tools, Free Map. "Elevation Finder". Jump up ^ "Pretoria Climate Normals 1961−1990". National Oceanic and Atmospheric Administration. Retrieved October 8, 2016. Jump up ^ "Klimatafel von Pretoria (Wetteramt), Transvaal / Südafrika"(PDF). Baseline climate means (1961-1990) from stations all over the world (in German). Deutscher Wetterdienst. Retrieved October 8,2016. Jump up ^ "Climate data for Pretoria". South African Weather Service. June 2011. Archived from the original on 8 March 2010. Retrieved 6 March 2010. Jump up ^ Population, according to the 2001 Census, of the Pretoria "main place". Jump up ^ Population, according to the 2007 Community Survey, of the City of Tshwane Metropolitan Municipality after the 2011 annexation of the Metsweding District Municipality. Jump up ^ tinashe (1 June 2012). "Transfer of the Indian community of Pretoria to Laudium ordered.". Jump up ^ "South African Reserve Bank Building, Pretoria | Building 103551". Pretoria /: Emporis. Retrieved 19 April 2014. Jump up ^ "National Botanical Gardens". SA-Venues. Retrieved 12 September 2008. Jump up ^ "Rovos Rail website". Rovos.co.za. Retrieved 3 July 2010. Jump up ^ "Capital Park". Rovos Rail. Archived from the original on 9 September 2008. Retrieved 12 September 2008. Jump up ^ "New Departure Point – Important note!". Friends of the Rail. Retrieved 12 September 2008. Jump up ^ "Tshwane Bus Booklet". Archived from the original on 28 May 2010. Jump up ^ ": Ditsong Museums Of South Africa :". Ditsong.org.za. Archived from the original on 28 May 2014. Retrieved 19 April 2014. Jump up ^ "Traditional & Folk Songs with Chords: Marching To Pretoria,". Traditionalmusic.co.uk. Retrieved 19 April 2014. Jump up ^ traditionalmusic.co.uk, op. cit. Jump up ^ ""'I Am the Walrus' Lyrics," Shmoop: We Speak Student". Shmoop.com. Retrieved 19 April 2014. ^ Jump up to: a b "Pretoria Art Museum - Pretoria Attractions - Gauteng Conference Centre Midrand". Jump up ^ "Theatres in Pretoria". Jump up ^ "Madiba’s Journey – South African Tourism". Jump up ^ "World's largest statue of Mandela unveiled". 17 December 2013. Jump up ^ Premier Soccer League (13 May 2012). "Tuks secure Premiership promotion - SuperSport - Football". SuperSport. Retrieved 16 November 2012. Jump up ^ "AmaTuks make it to top flight". Sowetan LIVE. 10 May 2012. Retrieved 16 November 2012. Jump up ^ "ABLEWIKI:Old Synagogue (Paul Kruger Street)". WikiUP. Retrieved 19 April 2014. Jump up ^ "Synagogues in Pretoria - Shuls in Pretoria - Jewish Temples in Pretoria". Maven.co.il. Retrieved 19 April 2014. Jump up ^ Bodel, J.D. ; 'The Coat of Arms and Other Heraldic Symbols of the City of Pretoria' in Pretoriana (November 1989). Jump up ^ Transvaal Official Gazette 2372 (11 March 1953). Jump up ^ 'Nuwe Standswapen' in Toria (July 1989). Jump up ^ "SA Universities Retrieved 21 January 2011". Universityworldnews.com. Retrieved 12 January 2012. Jump up ^ "About Veterinary Science > University of Pretoria". Web.up.ac.za. 25 August 2010. Archived from the original on 17 January 2012. Retrieved 12 January 2012. Jump up ^ "Wits Business School". MBA.co.za. Archived from the originalon 9 August 2007. Retrieved 12 January 2012. Jump up ^ "Retrieved 20 March 2010". Mba.co.za. Archived from the original on 9 August 2007. Retrieved 12 January 2012. Jump up ^ "UP in a Nutshell 2008" (PDF). Archived from the original(PDF) on 19 February 2012. Retrieved 12 January 2012. Jump up ^ "Profile of the". CSIR. Retrieved 16 November 2012. ^ Jump up to: a b c d e "contact us". Army.mil.za. 13 December 2010. Retrieved 19 April 2014. Jump up ^ "Google Maps". ^ Jump up to: a b Col (Ret) Lionel Crook. "South African Gunner" (PDF). rfdiv.mil.za. Archived from the original (PDF) on 13 June 2013. Retrieved 9 February 2014. Jump up ^ "Pretoria Regiment". Saarmourassociation.co.za. Archived from the original on 2 March 2014. Retrieved 19 April 2014. Jump up ^ "SA Army Signal Formation". Army.mil.za. 19 August 2013. Retrieved 19 April 2014. Jump up ^ "The South African Air Force". Saairforce.co.za. Retrieved 19 April 2014. Jump up ^ "Pretoria name change is approved". BBC News. 27 May 2005. Retrieved 3 July 2010. Jump up ^ "SABC pulls 'Tshwane city' ads". News24.com. 11 April 2007. Archived from the original on 9 March 2009. Retrieved 3 July 2010. Jump up ^ Independent Online. "SA capital advert row sparks ad-alert threat, IOL". Iol.co.za. Retrieved 3 July 2010. Jump up ^ "Down with Pretoria signs! : South Africa: Politics". News24. 2 August 2007. Archived from the original on 9 March 2009. Retrieved 3 July 2010. Jump up ^ Wilson Johwa. "Mashatile postpones name changes after ‘technicality’.". Businessday.co.za. Retrieved 3 July 2010. Jump up ^ "AfriForum to fight for Pretoria name.". Timeslive.co.za. Archived from the original on 3 February 2010. Retrieved 3 July 2010. Jump up ^ Independent Online. "Pretoria name change rethink". Iol.co.za. Retrieved 3 July 2010. Jump up ^ "Pretoria/Tshwane delayed.". Jacarandafm.com. 2 February 2010. Retrieved 3 July 2010. Jump up ^ "Xingwana retracts Pretoria name change.". Politicsweb.co.za. Retrieved 3 July 2010. Jump up ^ "It's officially Pretoria. iafrica.com". News.iafrica.com. Retrieved 3 July 2010. Jump up ^ "Pretoria is Pretoria again – for now.". Jacarandafm.com. Retrieved 3 July 2010. Jump up ^ "Government policy.'Leadership'". Leadershiponline.co.za. 23 March 2010. Archived from the original on 11 June 2010. Retrieved 3 July 2010. Jump up ^ "Tshwane Royals: 'Change Pretoria for benefit of all'.". Timeslive.co.za. Archived from the original on 17 March 2010. Retrieved 3 July 2010. Jump up ^ Location Settings (22 November 2011). "Pretoria will become Tshwane - mayor". News24. Retrieved 16 November 2012. Jump up ^ "Old cities, new names | Radio Netherlands Worldwide". Rnw.nl. Retrieved 16 November 2012. Jump up ^ "Pretoria of Tshwane? Minister weet self nie". Beeld. 27 January 2012. Archived from the original on 31 January 2012. Retrieved 16 November 2012. Jump up ^ "The Grove Ice rink". Retrieved 25 February 2014. This page was last edited on 26 October 2017, at 00:26.